I received an excited phone call about a month ago from a friend who was shopping at Walmart. He told me of an RC truck being sold in the sporting goods section that had a real working airsoft turret that you could aim and shoot remotely. My first reaction was, "Do want, but..." Then he told me the price, and I had to update my response to, "Must have." As of this writing, some online stores sell this vehicle for $80 to $150 US, but Walmart had it for $50. The Justice Dealer is about 15" long and 10" tall. Its oversized turret is controlled from buttons on the top of the controller, and it can both rotate left & right and change its elevation (tilting the barrel up & down). It shoots standard-sized 6mm plastic airsoft pellets, of which the package includes 400, enough to completely fill the truck's ammo well just once. From the start, I thought the turret alone made the Justice Dealer an awesome deal (if it works well), but once I had it out of the package I quickly learned new things that impressed me even more. First, the truck has permanent four-wheel-drive, with separate motors driving the front & rear. The independent transmissions allow you to manually select between two gears. There's a low setting for slow movement and a lot of torque, and a high setting that sacrifices grunt for higher top speed. Those transmissions are integral to solid front & rear axles, and those entire axle assemblies, in turn, are attached to very flexible 3-link suspension setups featuring soft coil springs. As you'll see in the video, the suspension can "flex" or articulate like a really serious off-roader or light-duty rock crawler. It gets better. When I bought the truck, there was a 7.2V battery/charger combo on the shelf next to it, being sold for $20. I mistakenly assumed this meant the truck needed a big 7.2V rechargeable battery pack to operate. I was wrong. It will run just fine on 6 AA batteries (either alkaline or rechargeable), which you install from the bottom of the truck. However, if you buy the 7.2V battery set, or if you happen to already have one (it's a common battery size in the hobby-grade RC world), you can install that high in the cab of the truck by simply removing the roof, which does not require any tools. What's more, the radio system that controls the Justice Dealer features a four-band setup. By selecting matching channels on the controller and truck, you can have four of these vehicles running in the same area without radio interference, even if they're all the same color. This is where things could have gone very, very sour with the Ignite RC Justice Dealer. However, instead, all of the cool design features of the truck were backed up by very respectable performance. High gear gets the truck moving fast enough to look like a scale military truck moving at highway speeds. Low gear brings it down to a prowling pace and gives it the torque to drive up inclines, through short weeds, and over very bumpy dirt. Speaking of bumps, the soft suspension does a phenomenal job of conforming to terrain, better than nearly all toy-grade RCs I've ever tested; only a few of the most hard-core "rock crawlers" do better. With four-wheel-drive the Justice Dealer is able to power over (or through) a lot of obstacles without bogging down, and if it does get an axle caught up on something that's too big for it, you can almost always back out of the situation without having to walk over to the truck and rescue it by hand. The only real negative here is that it doesn't have digital proportional controls, so both steering and throttle are all-or-nothing. The turret takes things to another level. It has smooth, slow controls including turning through a full 180 degrees of rotation (full left to full right) and angling between flat & horizontal for a straight shot all the way to around 45 degrees for maximum distance. The shooting mechanism is spring-loaded like an inexpensive airsoft gun, but it's fully automatic. Those little plastic BBs exit the barrel with quite a lot of speed, though, enough to sting you really well if you make the mistake of putting your hand or bare leg in front of it. This is a toy that can cause a lot of pain! It can do damage to non-living things as well, shooting straight through leaves, paper bags, and even thin aluminum cans. Aiming can take a lot of tries because the turret motors don't have very fine control, and they tend to have a little bit of follow-through where they don't immediately come to a full stop when you let go of the button. It just takes a little getting used to. For fine left to right aiming, it can sometimes even be helpful to use the truck to slightly move or turn your shot. The Ignite RC Justice Dealer is not the type of RC you pop batteries into and hand over to a small child for unsupervised play until the charge runs out. The turret on this thing means business. In reasonably responsible hands, though, it's a thing of amazement. 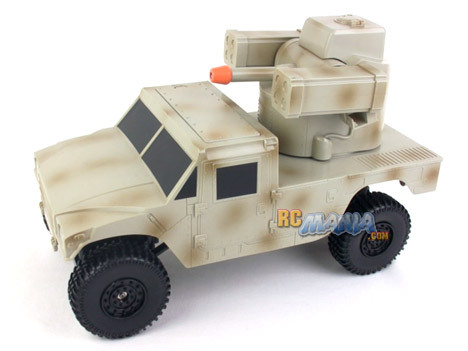 As an RC truck alone it's already a very good product, but the remote turret puts it into a whole different class of fun & entertainment. My one serious recommendation? Be mindful of the ammunition. The 400 included BBs can be easily used up in a single battery charge. Also, where they are shot, they tend to stay. I suggest picking up a bottle of 5,000 biodegradable BBs for about $15 online.